Dr. Hanan Ashrawi has been a central player in the struggle for a Palestinian homeland. A tireless campaigner for human rights, she has distinguished herself in both the academic and political arenas. Her academic expertise has played a vital role in the development and recognition of Palestinian culture, while her longstanding political activism on behalf of the Palestinian people has contributed greatly to the establishment of an independent and self-governing Palestine. 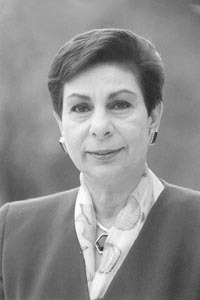 Dr. Ashrawi received her Bachelor and Master's degrees in literature in the Department of English at the American University of Beirut. After earning her Ph.D. in Medieval and Comparative Literature from the University of Virginia, Charlottesville, Dr. Ashrawi returned to her homeland in 1973 to establish the Department of English at Birzeit University on the West Bank. She edited the Anthology of Palestinian Literature. She is the author of The Modern Palestinian Short Story: An Introduction to Practical Criticism; Contemporary Palestinian Literature under Occupation; Contemporary Palestinian Poetry and Fiction; and Literary Translation: Theory and Practice. (I felt ashamed when I wet my bed, but no one scolded me). As heavy as its meaning. What’s the difference between a shell and a bullet? A girl within her mother’s sight. In a life that I no longer know? with my one remaining eye? they made the world look strange. who didn't know any better.